A man called Duke (James Garner) reads a notebook to his dementia-stricken wife (Gena Rowlands). He tells her the story of two young star-crossed lovers named Noah (Ryan Gosling) and Allie (Rachel McAdams), who are from opposite sides of the tracks. Noah is a working-class guy who makes a living at a lumber mill and Allie is a wealthy young heiress who likes to paint and has every advantage imaginable. Despite different backgrounds, they fall in love and want to be together, but everything and everyone else is trying to tear them apart. Nicholas Sparks is a name that drives fear into the hearts of men and has done so for nearly the past 2 decades. Between his hokey ideas of what love should be and the film versions of his hackneyed books, there has been a hefty amount of unrealistic expectations of love for the past 16 years and he is the leader of the charge when it comes to this mindset. 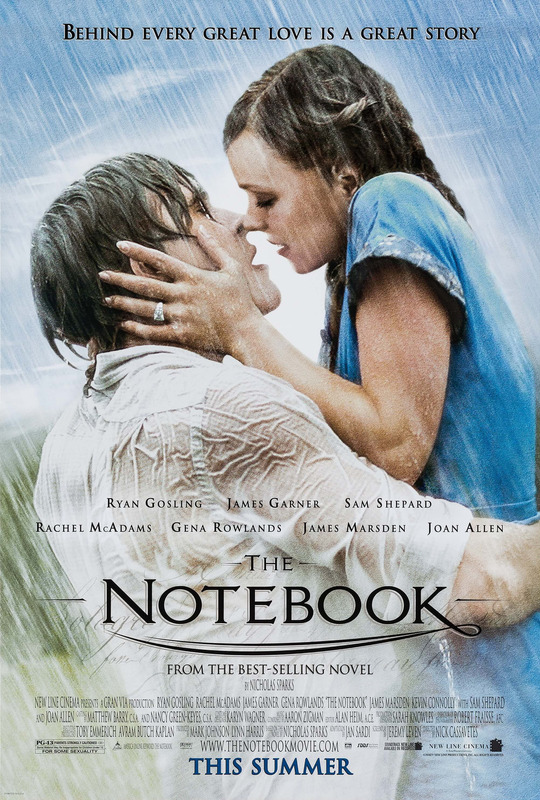 "The Notebook" is one of his first book-to-film adaptations and is by far the most famous and most successful of those films. There is a reason for that success as it is most certainly the best of the bunch, at least of the few we've seen. Set in typical Sparks fashion, the south takes center stage here with its charmingly beautiful landscapes, which lends to the film's overall amorous feel. Not only this, but it also allows the rich versus poor storyline to be truly felt and utilized to the story's advantage by having it set in a place with such a variety of huge, lavish houses and large plantations. Ryan Gosling plays a young Noah, who is a poor, handsome working-class man who falls madly in love with Allie, a rich girl who spends her strictly scheduled days not knowing she wants more from life. Allie is played by Rachel McAdams, who catapulted to stardom after this film. Allie also loves Noah with all her heart, but her family, primarily her mother Anne, played bitchily and snootily by Joan Allen, doesn't approve of their relationship. At first, it seems like everyone around them believes their tryst is simply a summer fling, but when Noah overhears her mother's disapproval of him, he breaks off what could be the romance of a lifetime despite his feelings for her. He never truly gets over Allie, even after almost a decade goes by. No matter what he does, Noah always has Allie in his thoughts and becomes a bitter, angry and resentful person in both his life and in his notions of love. He even builds their dream house, thinking of Allie every step of the way. These two fine young actors play well off of each others emotions and we almost couldn't believe it when we heard Gosling disliked McAdams on set, especially since they went on to date for several years. We're sure this is the stuff of fantasy for some woman: a gorgeous, hard-working young man pining endlessly over you for decades, never fully moving on with his life because he is so pained without your love. Really, what more could you want from life? Perhaps, maybe, a second wealthy man who loves you? No problem! Allie has that as well in Lon Hammond, played suavely by resident Sparks aficionado James Marsden, who is a war veteran Allie tended to in the hospital. Lon is Allie's fiance and someone who she fell in love with while she and Noah were apart, but the instant she agreed to marry him, she thought of Noah. Eventually, as with all great movie romances, Noah and Allie are reunited and she is forced to make the ever so difficult decision of choosing between James Marsden and Ryan Gosling, after, of course, an afternoon drive and a lesson from her jaded mother that explains the entire reason why the greatest love of Allie's life was destined to crumble to the ground. OOoooooo, decisions, decisions! What is a girl to do!? All romance movies require a little suspension of disbelief, and though we're sure this scenario does happen from time to time in reality, it's all a little too perfect in the grand scheme of relationships and love. In our opinions, the best part of this story is the portion with the older couple, played by James Garner and Gena Rowlands. Garner has moved into an old folks home/hospital with Rowlands and continues to read to his dementia-stricken wife from a notebook day in and day out in the hopes she will remember him, even if it's just for a fleeting moment. These instances of love through illness, forgetting, and uphill battles are what really makes us tear up and want to root for them against all odds. The love between Noah and Allie seems to be mainly physical and rebellious at first, even though Rachel McAdams and Ryan Gosling had craaazy good chemistry. Eventually, only after they break up and are separated for years do we come around to fully believing in the resurrection of their relationship. However, there is never any moment of doubt about the love between Garner and Rowlands. Even when she doesn't remember, you can see it in her eyes that she has loved and has loved deeply. We believe this to be the portion of the story that struck a chord with not just us, but with others, too, and what has led the film to being so well received and successful over time. It takes it a step above just being another love story and takes it straight into romance movie hall of fame.